Sinister elements in the West and the anti-Sri Lankan lobby, including the LTTE rump, know that the present Government and the Head of State do not dance to their melody. Ever since President Mahinda Rajapaksa was first elected President in November 2005, they have been making every effort for a regime change and create a leader who would pay hosannas to the West. They are fully aware that they should make use of ‘indigenous stuff’ to press for a regime change. Hence, the sinister elements in the West and LTTE rump have been on the lookout for traitors who are willing to betray their country in their lust for power. Many people have betrayed nations from time immemorial. There are many instances in which opportunists had turned traitors, totally ignoring the interests of their motherland. There is no exception in Sri Lanka and from ancient times, there had been power-hungry characters who had betrayed the country for petty gains. Even during the ancient times when the country was ruled by kings, there have been enough and more characters who had turned traitors and betrayed their country. Especially during the British rule, the then Governors always looked for prominent people whowere greedy for power, titles and wealth. They made use of these characters to conspire against Sinhala Kings. When the West was looking for such a character to oust President Rajapaksa in 2010, they had a prize catch in Sarath Fonseka. The Western godfathers and the Tiger cohorts thought they would definitely be able to make a regime change, using Fonseka’s then popularity as the Army Commander during the Security Forces’ battle against terrorism. But the masses were far more intelligent than those sinister elements in the West and the anti-Sri Lankan lobby, including the LTTE rump. The masses know how they should differentiate a good military leader from a patriotic politician. Hence that 2010 coup was effectively vanquished by the masses that rallied round President Rajapaksa during the 2010 presidential election. Four years later, the self-same elements who are daydreaming of a regime change have found another person to play the role of a traitor, identical to what Fonseka played in 2010. In former minister and ex-general secretary of the SLFP Maithipala Sirisena, the Western godfathers and LTTE rump have found just what they have been dreaming of! When one compares the two traitors, there is a huge difference. 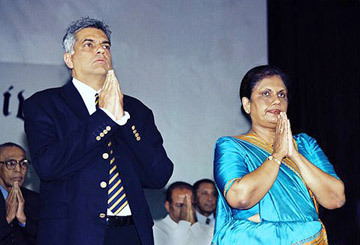 Fonseka was far more popular than Maithripala. Although he boasts of over four decades of political experience, Maithripala was never a national figure. True that he held the all-important post of SLFP General Secretary and a top ministerial portfolio but the masses had never considered him a national figure. His popularity was only confined to the Polonnaruwa district. In contrast, Fonseka was far more popular and a national figure when he contested the 2010 presidential election. It's a sin.......Father forgive me! Yet, the masses did not endorse Fonseka’s name as a political leader though they had gratitude for him for his military achievements. However, Fonseka was no match to President Rajapaksa and was comprehensively beaten. When one carefully analyses these facts and the thumping majority President Rajapaksa enjoyed in winning the 2010 presidential election, one could well imagine how miserable Maithripala would fare at next month’s presidential election. Since the UNP-led Opposition is backing his candidature, Maithripala must be daydreaming that he could win the 2015 presidential election. Let him stay in that political fantasy until January 8, 2015. Fonseka too lived in such a wonderful political fantasy for 45 days in 2010 before he finally found where exactly he stands. Before handing over his nominations, it not too late for Maithripala to get a political lesson even from a novice such as Fonseka. In a recent joint Opposition news conference, Fonseka had told the bitter truth about a so-called common candidate. Fonseka said though many politicians and parties were behind him during the 2010 presidential election, he said everybody deserted him after the defeat, from the moment the results were announced. He added that he had to make his own lonely battle for survival after losing the election and none of the political leaders in the so-called joint Opposition ever uttered even a word of comfort. Fonseka’s stark facts and first-hand experience should be a good eye-opener to Maithripala who is under a delusion. Fonseka too was under a similar delusion during the run up to the 2010 presidential polls. Most importantly, Fonseka commanded the support of almost the entire Opposition, including the fullest backing of the UNP as well as the JVP. But Maithripala cannot boast of the same support or the identical popularity. The JVP has not agreed to support Maithripala’s candidature yet. Even if the JVP extends support, the party would lost the support of grassroots level when the JVP seniors asks to vote for a person whom they have criticized heavily. However, after finishing way behind at the 2010 presidential election and being isolated by all those joint Opposition leaders who pretended that they are extending support, Fonseka has now understood the bitter truth. What Fonseka understand now will become a gospel truth to Maithripala from January 9, 2015, the day the results of Sri Lanka’s seventh presidential election are to be announced. The presence of former President Chandrika Bandaranaike Kumaratunga next to Maithripala in Friday’s news conference would do more harm to the joint Opposition candidate than good. Maithripala vowed to abolish the Executive Presidency within 100 days, if he is elected. It was the laughing stock – Mathripala making such a promise while having Chandirka on to his right as she is the lady who made similar promises in 1994. Chandrika even set a definite timeframe to abolish the Executive Presidency and never kept her promise. It is with such a lady, who had done virtually nothing notable during her 11-year tenure, that Maithripala is going to embark this journey. From the day the then Prime Minister Mahinda Rajapaksa was nominated to contest the 2005 presidential election by the SLFP Central Committee, Chandrika has conspired. She made every effort to ruin the chances of the candidate her own party. But the masses knew that all those sinister campaigns against the then Prime Minister were due to Chandrika’s lust for power. Chandrika appeared to be a Western puppet in all her dealings with the LTTE, dancing to the melody of the INGO rump. The Opposition has embarked on an ambitious journey to win at any cost. In fulfilling that dream, they are even ready to embrace the pro-LTTE goons in the TNA as well as the Tiger cohorts in the West. The Tiger proxy TNA which attempted to pump the last drop of oxygen to the LTTE leadership during the 2006-2009 humanitarian operation will put forward demands that are detrimental to country’s sovereignty and territorial integrity. But the UNP-led Maithripala’s camp would not have an iota of shame in agreeing to all those. If not for President Rajapaksa, the country would have still been subjected to LTTE terror. Unfortunately, some power-hungry Opposition politicians have deliberately forgotten this fact. 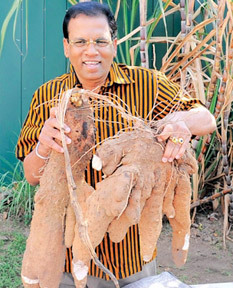 Maithripala is a blind follower of Chandrika but he has forgotten how the former President had treated him in the past. When Maithriplala was well set to become the SLFP General Secretary during Chadrika’s tenure as the President, she strategically eliminated Maithipala from the race to give the post to one of her then confidants. Maithipala should not believe that Chandrika has teamed up with him with sincere thoughts. Chandrika does not like to see the SLFP and the country prospering under the able political leadership of President Rajapaksa. It was a mere political jealousy due to Chandrika’s extraordinary greediness for power. Even after holding the Executive Presidency for two successive terms, Chandrika is unable to give up his lust for power. All past Presidents had spent their retirements in exemplary manner, without poking their fingers into their successor work. When former President R. Premadasa made blunders after blunders, his predecessor J. R. Jayewardene did not utter a word and let Premadasa to run the country the way he wanted. In contrast, Chadrika has been making sarcastic comments and conspiring with her former confidantes from the day President Rajapaksa assumed office. Her aim is to destroy the party her late father Prime Minister S.W.R.D. Bandaranaike had founded simply because it is headed by the incumbent President. The UNP will soon fall into Chandrika’s trap laid through Maithripala whose chances of becoming the President are extremely slim. Even if he becomes the President, he would not let Ranil become the Head of State within 100 days as promised. 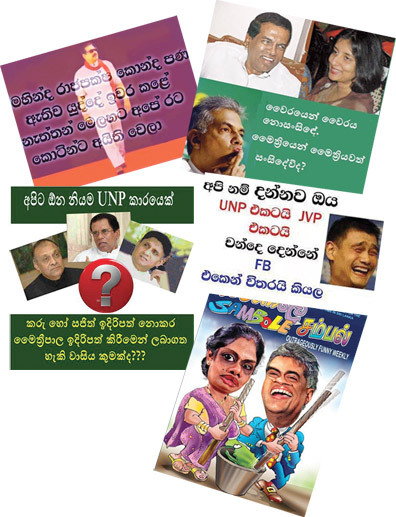 Maithripala is a mere puppet of Chadrika and her political confidant Mangala Samaraweera. When Ranil and Mangala were finding a way out and save Ranil’s UNP leadership as well as the Opposition leader post, Chadrika suggested the name of Maithripala whom they could control easily. Hence, Ranil had no hesitation in endorsing Maithripala’s name as the common Opposition candidate, a dual purpose exercise for the UNP leader. First, Ranil could avoid the embarrassment of losing another election by making Maithripala a scapegoat. Secondly, he could well wash his hands off saying that it was not his defeat but that of Maithripala and face the pressure from Sajith group to hang on to the UNP leadership. Unfortunately, Maithripala had become a victim of Chandrika-Ranil-Mangala conspiracy. What Maithripala cannot understand now would be proved to him by January 9, 2015 - the day the joint Opposition would desert him. 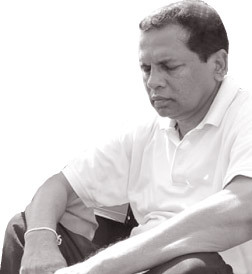 Maithripala is now getting ready for the episode two of the greatest betrayal after Fonseka starred in episode one. It won’t be a surprise if the UNP forces Maithripala to win at any cost by obtaining the support of the TNA and the LTTE rump. Definitely they will lay conditions but the joint Opposition will not hesitate to agree to whatever those conditions in their lust for power. They would even go to the extent of teaming up with extremist elements and the Tiger cohorts to create dissension in the country. The Opposition could even sell the country’s hard-earned peace, if they find that as a short cut to capture power. There was a similar conspiracy in 2010 but the masses extended their overwhelming support to President Rajapaksa to thwart conspiracies of peace mongers. Though Maithripala is yearning to become another Fonseka and rob the country of its hard-earned peace, the masses would teach them an unforgettable lesson. It will be then that Maithripala would endorse Fonseka’s current views on common candidate.